You can beat the oil giant's high-quality payouts with even better dividend stocks. Here are three great ideas. There's nothing quite like a good, solid oil dividend, right? Anyone looking for a strong dividend payout backed by torrential cash flows must surely be impressed by ExxonMobil's (NYSE:XOM) 3.7% yield and 34 years of uninterrupted annual dividend increases. Exxon is indeed a great income stock, but there are many dividend stocks out there that offer even better policies than the oil giant. You don't even have to stick within the energy market. A panel of your fellow investors here at The Motley Fool has put together a handful of stocks with better yields than ExxonMobil. Read on to see how Spirit Realty Capital (NYSE:SRC), Verizon Communications (NYSE:VZ), and Six Flags (NYSE:SIX) can beat the big oil stocks from the perspective of a dividend hunter. You can do better than Exxon. Image source: Getty Images. Jordan Wathen (Spirit Realty Capital): Shares of this retail-focused REIT are too cheap to ignore. Though the company has struggled under the weight of its largest single tenant, Shopko, investors are pricing the stock as if its portfolio were filled to the brim with similarly weak tenants. That's not the case, in my view. To be sure, Shopko is a large tenant for Spirit Realty, making up about 7.8% of contractual rent, compared with 2.6% and 2.4% for its second- and third-largest tenants, respectively. But the portfolio, which includes more than 2,400 properties, is generally leased on a triple-net basis to high-quality restaurants, pharmacies, convenience stores, and movie theaters, all of which derive benefits from proximity to their customers (they can't just move to lower-cost locations). Chris Neiger (Verizon): It's nearly impossible to put together a list of dividend stocks with high yields and not mention Verizon. The telecom giant currently has a trailing annual dividend yield of 4.9% and has a 10-year history of raising it every year. The company's wireless business drives its top line, and increasing competition from its rivals has kept Verizon on its toes lately. Wireless revenue of $21.6 billion fell more than 2% year over year in the third quarter of 2017, but there isn't much for investors to worry about over the long term. Verizon added 486,000 postpaid smartphone net additions in the quarter -- which is on top of 590,000 net smartphone additions in the previous quarter -- and show that even the comparable LTE networks from Verizon's competitors aren't enough to siphon off the telecom's loyal and growing customer base. The company will be dependent on its wireless business for years to come, but the telecom giant has been expanding into content as well after it bought AOL a couple of years ago and through its most recent purchase of Yahoo!. 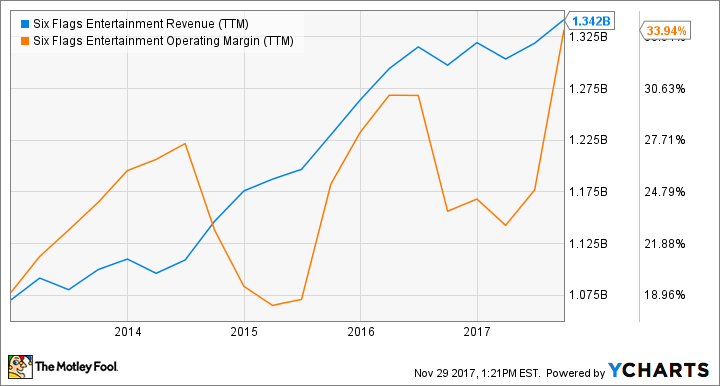 This should help diversify Verizon's revenue in the coming years -- albiet not much at first -- and shows that this long-standing telecom giant understands how to stay nimble in an increasingly competitive wireless market. Verizon's shares are currently trading at just 12 times the company's earnings, and its dividend yield continues to climb. Add to that all of the advantages mentioned, and investors are looking at a strong dividend investment for years to come. That shareholder-friendly dividend policy has seen its yearly payouts more than doubling in five years, rising from $1.20 per share five years ago to $2.80 today. Payout boosts have generally kept pace with the stock chart's upward march, keeping Six Flags' effective dividend yields fairly steady near the 4% level. Looking ahead, Six Flags is exploring international expansion options in places like Dubai and China. A long-standing partnership with Time Warner's (NYSE:TWX.DL) DC Comics division should continue to benefit from Warner's renewed interest in fresh movies featuring classic DC characters such as Batman and Aquaman, both of whom are featured in several Six Flags rides.